Lawrence once described London as the place ‘where I would choose to live exclusively, if I have to live in only one place’. recommended to read Jeremy Wilson’s article, Lawrence in London, which appeared in the Society’s Journal in Spring 2002. It is impossible to assign a single motive to his affection for London. In 1919, Lawrence acquired the use of an attic room in Barton Street, Westminster, which became his London base for several years. From this refuge he was able to visit London’s art galleries and museums, and to develop his liking for classical music with visits to the promenade concerts. Living in London gave him access to good book shops, and to his widening circle of literary and artistic friends. allowed him to make many visits to London from his often distant postings. Plymouth is 230 miles from London but in a letter to Sir Hugh Trenchard he claimed that he could do the journey in 4 hours and 44 minutes – much the same as estimates for travel times today! 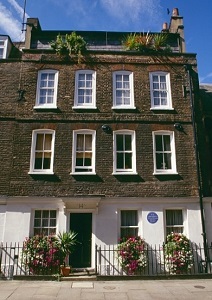 Just as an isolated forester’s cottage became Lawrence’s retreat in Dorset, so an attic room at 14 Barton Street, Westminster, provided him with a refuge from the crowds in London. distinguished architect Sir Herbert Baker, who leased the house from Westminster School to use as an office. It was here that Lawrence wrote much of his second draft of Seven Pillars of Wisdom after his original manuscript was lost at Reading Station towards the end of 1919, and he continued to use the room as his London base for years afterwards. ‘I’m perfectly well, and very comfortable in Barton Street which is quite beautiful,’ he wrote to his mother in 1922. ‘The quiet of so little a place in the middle of a great mess has to be experienced a thousand times before it is properly felt. I will be very sorry to leave’. Few descriptions have reached us of Lawrence’s attic room, so it is interesting to find the following record in the autobiography of the sculptor Sir Charles Wheeler, who visited 14 Barton Street to sculpt Lawrence in 1929. ‘The small room in which he wrote and slept above Baker’s office was littered with books. He was constantly sent new books for comment or review. He told me that one day he found it practically impossible to get into bed, so he filled his knapsack with the most recent novels and made nocturnal visits to Canons’ houses in Westminster Abbey Close to deposit those volumes which he thought most suitable in the most appropriate letter-boxes. Even today, to wander into Barton Street is to find an oasis from the hustle and bustle of Westminster. It is worth taking a street map and searching it out, though there is no public access to number 14 itself. A blue plaque records Lawrence’s association with the building. Herbert Baker’s own house at 2 Smith Square (also used by his mother Sarah and brother Arnold when 2 Polstead Road was sold) and the Union Jack Club where he was known as 353172 A/c Smith. The Union Jack Club still exists today, offering accommodation to non-commissioned members of the British armed forces. It has moved since Lawrence’s time from Waterloo Road to Sandell Street. pottery which he gave to the Ashmolean Museum; but it was with that most venerable London institution, the British Museum, that he began his archaeological career excavating the Neo-Hittite city of Carchemish. Today, the museum displays artefacts from Carchemish, and holds a collection of Lawrence’s reports, notebooks and letters which may be consulted by appointment. Keep an eye on its website for news of talks and exhibitions with a link to Lawrence. During the first months of 1914, Lawrence took part in a survey of the Sinai peninsula carried out under the auspices of the Palestine Exploration Fund as cover for a British military mapping operation in the area. His joint report with Leonard Woolley was published by the PEF as The Wilderness of Zin. Archive material held by the PEF includes some of Lawrence’s original paperwork and photographs from the survey. Its website contains information on its regular lecture series and how to arrange a visit to its headquarters in Hinde Mews. Avenue, before being posted to Military Headquarters in Cairo. he soon departed for the Middle East. In 1922, Lawrence left the Colonial Office and began making negotiations to enlist in the ranks of the RAF. At 10.30am on August 30 1922, it was arranged for him to turn up at the RAF recruiting office in Covent Garden to sign on under the name John Hume Ross. At 4 Henrietta Street, one can find ‘that little door’ where he paced up and down, trying to find the courage to go inside. It would be one of the major turning points in his life. London. But possibly his greatest pleasure was to go walking about the city on his own. bookshops, and savouring all that the city has to offer. A good starting point might be the former site of the Union Jack Club at 91 Waterloo Road, following a favourite route described by Lawrence himself, ‘up Embankment: Waterloo Road: Strand: St. Martin’s Lane; Charing Cross Road: Tottenham Court Road: Warren Street: tube back to Waterloo. Voila.’ A map of the city will help the walker find many Lawrence-related diversions along the way. father of the RAF, and a great friend to Lawrence in his service years. to the ‘Glorious and Immortal Memory of the Officers, NCOs and Men of the Imperial Camel Corps – British – Australian – New Zealand – Indian – who fell in action or died of wounds and disease in Egypt, Sinai and Palestine – 1916 – 1917 – 1918’. ance sold out, before it moved to the Royal Albert Hall in November. Three years later, and just a few minutes walk away from the Royal Opera House, Lawrence tried to escape from the legend that Lowell Thomas had created by signing on at the RAF recruiting office in Henrietta Street, as we have already seen. portraits are on display at any time; wandering through the 20th Century galleries will certainly bring one face to face with some of Lawrence’s acquaintances, however. Today, the Charing Cross Road is well past its heyday as a place to browse for secondhand and antiquarian books; though some of the shopfronts of the specialist bookshops in picturesque Cecil Court, which runs between Charing Cross Road and St Martin’s Lane, are said to have scarcely changed in one hundred years. 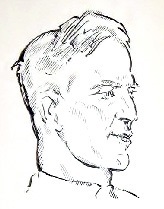 In March 1934, Lawrence himself called in at the artist Frederick Carter’s studio in Cecil Court and found himself posing for this drawing: one of the last portraits to be made of him. Archaeology at University College London, before heading up Tottenham Court Road to Warren Street for the tube back to Waterloo. Today, Lawrence’s legacy to London lies in the rich seam of artistic and archival material lodged in its great institutions and galleries. The collections housed in the British Museum, Palestine Exploration Fund and National Portrait Gallery have already been described. Below is a brief guide to some other collections held in London. To check what material is on display at any time, or to obtain information on accessing collections, it is advised to contact the institutions. interesting to see that on a postcard of tombs and memorials sold in the cathedral bookshop, Lawrence is placed alongside Florence Nightingale, John Donne, Lord Nelson, Ivor Novello, the Duke of Wellington and Sir Christopher Wren, who designed the cathedral. The Tate Gallery holds Augustus John’s famous ‘wrathful’ portrait of Lawrence in Arab dress, as well as bronze busts of Lawrence by Francis Derwent Wood and Eric Kennington. Reflecting Lawrence’s role as a collector of art, it also has a bronze bust of Sir Osbert Sitwell by Frank Dobson, which was owned by Lawrence. The British Library has 1922 and 1926 manuscripts of Seven Pillars of Wisdom, manuscripts of The Mint, Lawrence’s letters to the Shaws and his wartime diaries. The Hejaz stamps designed by Lawrence are also held here. 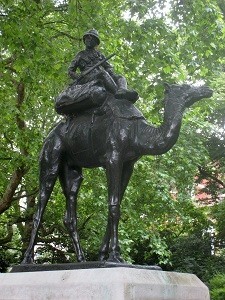 The Imperial War Museum holds the Lee-Enfield rifle given to Lawrence by Prince Feisal, his robe and headdress, and wartime photographic collection. Artworks include James McBey’s portrait and a bronze bust by Francis Derwent Wood. Anyone hoping to see Lawrence’s 1932 SS 100 Brough Superior motorcycle should note that it is no longer on display here. documents relating to his wartime career and subsequent service in the ranks. The RAF Museum holds some Lawrence letters. On display in the museum is Seaplane Tender 206, one of the 200 class developed by Lawrence and built by the British Power Boat Company.